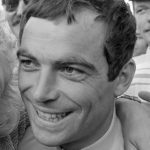 Bernard Hinault is a French former professional cyclist who won the Tour de France five times. He is one of only six cyclists to have won all three Grand Tours, and one of two cyclists to have won each more than once. He won the Tour de France in 1978, 1979, 1981, 1982 and 1985. He came second in 1984 and 1986 and won 28 stages, of which 13 were individual time trials. "Illegal drug use runs contrary to the image of health depicted by cycling. Distributors of these drugs must be prosecuted more harshly as they are ciminals."